Story Contracting has picked up a prestigious Network Rail Partnership Award along with some of the biggest names in the country. 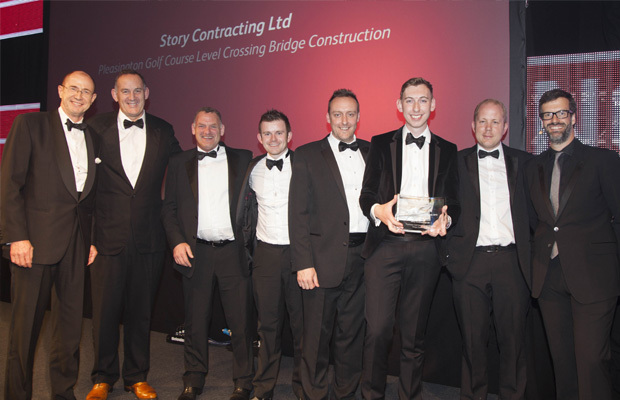 Story Contracting were up against strong competition to pick up Best Project at the national awards evening in Birmingham last night. Working together with Network Rail, Story Contracting developed an innovative solution to close the existing high-risk level crossing at Pleasington Golf course in Lancashire to provide an alternative method of crossing the railway. Although level crossings in the UK are among the safest in Europe, they still pose a significant safety risk to the public. Pleasington Golf Course’s level crossing was identified as within the top ten high-risk level crossings in the North of England. Story Contracting developed an overbridge solution which was a first for the railway in the UK. It was this exceptional show of capability by Story that now sees them award winners once again for their solution led services. The project used special construction methodology, which meant that the bridge installation was able to be completed by Story Contracting in two consecutive seven hour windows. Story’s safety and design principles enhanced the delivery of the overbridge, whilst causing minimal disruption to the rail timetable with no train delays experienced through the period of works. The bridge now cuts out the potential risk to pedestrians using the Golf Course. The success of this innovative project now offers Network Rail the opportunity to replicate the design solution in other regions. “It has been a phenomenal year for Story Contracting after being named as Network Rail’s Supplier of the year and to go into 2015 with a UK Rail Industry Award and now a Network Rail Partnership Award just shows how hard our team works at consistently remaining amongst the top suppliers to the industry. Our projects are continually breaking new ground and providing innovative solutions for our clients but this can only happen because of the talented team we have developed at Story Contracting.